Do you have a percussion ensemble in your school? or do the percussionists in your band need a little feature piece they can do in a concert? Have a practical class that you don’t know what to do with? 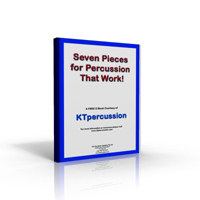 On these pages you’ll find some ideas to help, including class percussion arrangements featuring tuned and untuned percussion. Do you have a beginner drum line, or small drum corps that needs some simple, easy to implement and effective music? for easy to use and effective teaching materials? All music from KT Percussion is available for instant digital download, meaning that you can be using it in your classes and ensembles tomorrow! Want your school to order? This exclusive collection of sheet music includes a full percussion ensemble arrangement of “The William Tell Overture”, which has been sold on its own from this website for $49, plus it contains six other really effective pieces. If you are a classroom music teacher, then the class percussion pieces “I Don’t like Homework” and “I Like eating hot dogs” will be ideal for your elementary music class to learn about rhythm. Sold Separately, the value of these pieces add up to over $97, and they are yours free, just by entering your details below. The music from Kevin Tuck is fresh and exciting. I am a clarinetist teaching percussion ensemble, and appreciate the teachable music that I have bought. Tribal Beat Sound System is now a staple “encore” for most performances, and Mountains Rising is a challenge and inspiration to perform. The music excites my students to practice more, which benefits the concert and marching band with fundamentally sound percussionists. I was thrilled to finally find a site which had full scores of drumming music. My drumming group have started “Summon The Spirits” already and love it. Having a recording of the music was fantastic, because I can’t read notation very well. Thoroughly recommend this site & the pieces!